Canadians have long been weaned on Group of Seven legend; admired their art; lauded their talents; and been inspired by their tenacity in sketching and painting countless landscapes; east, west, north and south; spring, summer, fall and winter; ad mari usque ad mare. You needn’t be an artist to have heard of the iconic A. Y. Jackson (1882-1974) and other painters who followed closely in the steps of the Group of Seven, including the somewhat younger A. J. Casson (1898-1992). 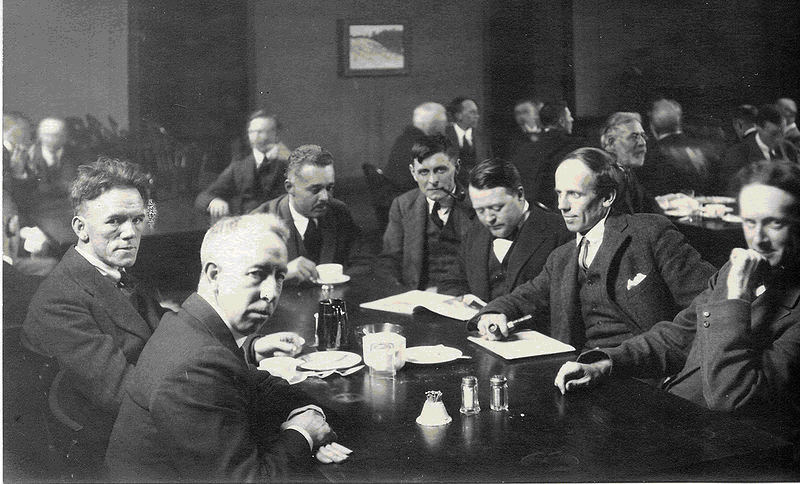 Members of the Group of Seven have all passed on, but institutions bear their names; their style is unmistakable, their legacy and impact live on, radiating from art galleries, private collections, prints and photos. They were a hardy, talented band of Canadians who enhanced the visual image of Canada and thereby helped mold a Canadian sense of self. They were mostly out there, mostly somewhere else in the vastness of Canada, plying their art, with results to be later admired in galleries. But occasionally they were actually among us, crossing paths, in our own back yard. One August day in 1965, my two younger brothers, Billy and Johnny, were walking along the gravel road, east of our family farm in Grenville Township. They were on Concession 2, (Chemin Du Moulin), returning after lunch-break, to continue making hay for a nearby farmer (Edgar Dawson). Just before arriving there, they noticed an elderly man in a field beside the road. Their curiosity was aroused, so they approached him through an open gate. He had an easel and was seated, intent on sketching the landscape before him, including the nearby grove of pine trees, the encircling field and the Laurentian backdrop to the north. When he noticed two teen-aged urchins peering over his shoulder, he gruffly dismissed them, saying he needed to focus on his work. It was not until some later time that they realized who they had then encountered. It was none other than Alexander Young Jackson, the legendary painter of Canadian landscapes and a leading advocate for the Group of Seven. Had they know in whose presence they were, they now tell me, they would have handled things differently. 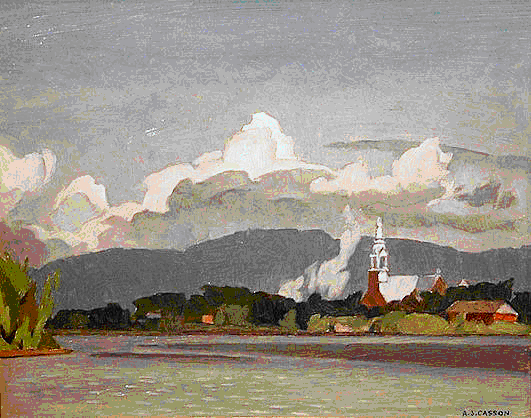 It is not generally known, but both A. Y. Jackson and Alfred Joseph Casson spent considerable time sketching and painting in Grenville Township during that era, where they found peace and inspiration along its gravel roads and among it’s mountains, rocks, rivers, farms and forests. A. Y. Jackson, the principle founding member of the Group of Seven, is arguably the most decorated Canadian painter of all time. He was a Quebec Anglophone; born at 43 MacKay Street, in Montreal, the third in a family of six. What makes his success as a painter somewhat amazing were his humble beginnings, particularly after his bankrupt father abandoned his wife and family in 1891 when Alex was only nine. In spite of these hard times, or perhaps even because of them, his talents would eventually flourish and the tribulations of youth would help mould the persistent artist he would become. Although of diminutive stature (5’5”), he was of rugged build and hardy constitution. He worked initially as a lithographer in Montreal, but spent many subsequent years in Europe, (including during WWI as both a soldier and an artist), the U.S., and everywhere in Canada. I have nearby, a constant reminder of A. Y. Jackson. Shortly after he died in 1974, a new high school was built on what had hitherto been pasture, just beyond my back yard in suburban Kanata, Ontario. You guessed it: it was named after A. Y. Jackson. I must admit that, at that time, I wasn’t really sure who A. Y. Jackson was. But, for over 40 subsequent years, and just now, as I am composing this, I look out my back window, across the football field, at A. Y. Jackson Secondary School and wonder about the man, the talent, the art, the legend. But why was A. Y. Jackson near Grenville in 1965, during the twilight of his career? It came about largely because of the Putnams, a couple who had moved from Manitoba in 1957, to a farm just east of Grenville. Munroe Putnam was ex-RCAF, turned forester, and then executive at the CIP pulp and paper mill in nearby Hawkesbury, Ontario. His wife Joyce was an amateur painter, while Munro collected art. 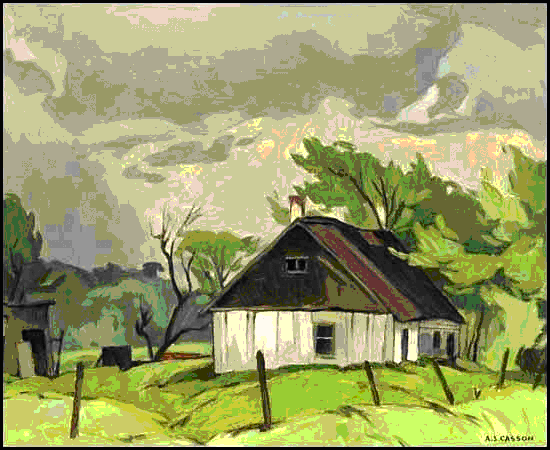 Joyce Putnam had met A. Y. Jackson at an art workshop in Ottawa and invited him to their hobby farm, to paint in and around Grenville. In 1966, A. Y. Jackson convinced A. J. Casson to accompany him on a sketching and painting trip to Grenville, guiding him to choice landscapes in the surrounding countryside. 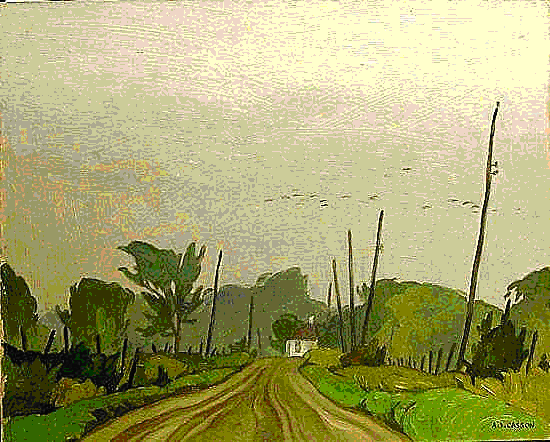 Casson also developed a great feeling for the area, as he returned to Grenville every year until 1972, producing at least 150 oil sketches there. So, for almost a decade, Grenville held the attention of two of the finest landscape artists. One might say that Grenville had it’s brush with greatness, as did my two younger brothers, on that memorable summer’s day in the mid-1960s. Shortly thereafter, on December 22, 1967, A. Y. Jackson was elevated to Companion of the Order of Canada, for having demonstrated, through his lifetime of achievements in art, the highest degree of merit to Canada and humanity. But just a few days before his Order of Canada investiture ceremony on April 26, 1968, Jackson suffered a massive stroke which effectively put an end to his painting career. His niece Naomi had to accept the honor on his behalf. Jackson died in 1974, over the Easter holiday, in a nursing home in Toronto. He was 91 years old. He is interred on the grounds of the McMichael Conservation Estate in Kleinberg, Ontario, (just north of Toronto), as are A. J. Casson and most of the other members of the Group of Seven. A picture is worth a thousand words, but what’s often missing in landscape paintings is human context. The Casson painting to the right is an example. Neighbors who lived on Chemin Du Moulin knew it as Véronique Mallette’s place. It was a humble abode with no power, running water, or telephone service. Mrs. Malette, an elderly widow of limited means, lived there alone. And she was pious, getting a ride with neighbors to Notre Dames des Sept Douleurs Catholic Church, (depicted in Casson’s painting above), in Grenville, every Sunday. She also did her grocery shopping at Côté’s Bakery. Some stores opened on Sundays after mass, for the convenience of just such folks as Mrs. Mallette, who could not easily get to town often. While stepping backwards to better view provisions on a top shelf, she fell through a trap door which had inadvertently been left open. The fall into the basement seriously injured Mrs. Mallette and she went to the hospital and thereafter to a nursing home, never to return to the home Casson had painted. The next time you meander through an art gallery, keep your eye peeled for some of the famous Grenville landscapes by Jackson and Casson. The scene below I also recognize as along Chemin Du Moulin, near our family farm. I walked that gravel road many times as a kid. 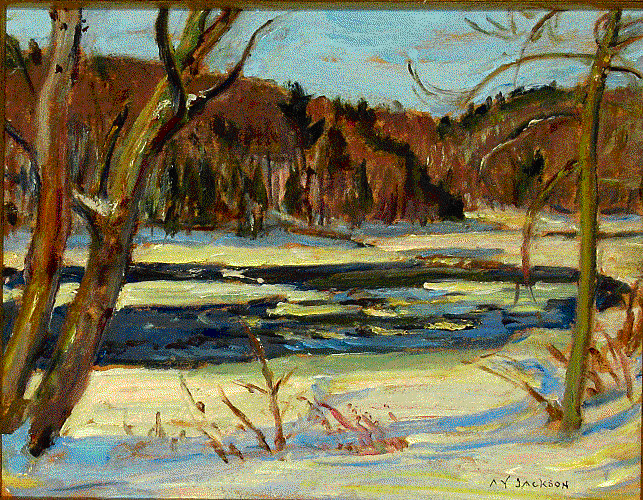 Joyce Putnam, instrumental in bringing A.Y Jackson and several other Group of Seven painters to Grenville Township, in the 1965 to 1972 time frame, published Seven Years with the Group of Seven in 1991.